When storing your bel ongings away from your home, you want to be sure that they will be kept under the best possible conditions. Specialty items may need climate-controlled storage. What is climate controlled storage, you ask? Keep reading—this guide will tell you what you need to know about climate-controlled storage and what kind of items should be stored there. Because many specialty items need to be kept at certain temperatures as well as protected from the elements, storage facilities offer units that are climate controlled. The temperature in those units is regulated so that they do not drop below or go above a certain temperature range, generally between 60 and 80 degrees Fahrenheit. These units also offer protection against excess humidity and moisture which can lead to mold growth and the decay of some of your items. Keep in mind, that not all storage facilities offer climate-controlled units, and the ones that do may offer them at a premium, so you should expect to pay a bit more for the added protection. Knowing when you should choose climate-controlled over non-climate-controlled is important. If you only plan on storing things for a short period of time sometimes it's better to save yourself some money and choose a non-climate-controlled unit. It would only be beneficial to choose a regular unit for your expensive items if you know the weather will be agreeable for the time that you're going to be storing your items. If you live in a climate that's normally humid in the summer and rainy in the fall, then it would be best to store your items in a climate-controlled unit - even if it is only for a short time. If you're planning on storing your items for the long-haul and you need them to stand the test of time, a climate-controlled unit might be your best bet. Moisture is the enemy when it comes to storing your expensive electronic equipment. Condensation can accumulate inside the metal parts causing damage and wiring to degrade. Changes in temperature can cause moisture to build up leading to mold which can stain and destroy paintings, photos and books. Organic natural materials like linen, cotton and wool. You can avoid the mustiness and mildew smell on your seasonal wardrobe by utilizing a climate-controlled storage unit. Antiques can warp, split and crack depending on the environment causing it to degrade to the point of lost value. When preparing your items for storage you should always take the necessary steps to prevent as much damage as possible, regardless of whether you're opting for a climate-controlled storage unit or a regular storage unit. Plan ahead when getting ready to store your items. If you live in an exceptionally humid area, consider using moisture absorbers. While the temperature regulation does help prevent moisture, there are no guarantees that it will eliminate ALL the moisture. When storing antiques be sure to cover them in moving blankets or wrap them in bubble wrap if necessary to prevent damage. If you're going to be storing photographs, use archival and acid-free storage materials to prevent deterioration. You should also separate any photos that are in poor condition from any that are in good condition. Wrap any electronic equipment in its original packaging to protect the exterior from damage. If not, the electronics should be packaged in a box with packing paper as an added bumper and covered to protect it from dust and debris. 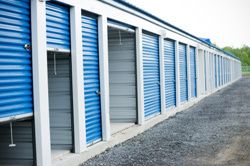 Do you need help moving your items into a storage facility? Movers.com can connect you with the moving company you'll need to make your next move easy and stress-free.